Says 'closed' on this website but as John Wayne once put it, The hell I am. 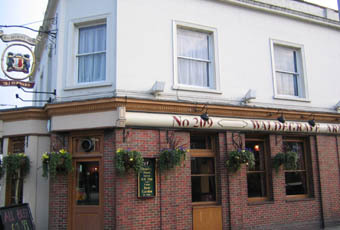 The revived Waldegrave (or Waldy) is a lively pub in a pleasant area of Teddington away from the centre. Sharps beers and Quins Ale were on. Food menu. Barstaff nice. Popped in for the first time since it has reopened and was met by a very friendly barmaid who was very helpful and chatty. There were a couple of big TV's showing the rugby and three ales ready for tasting. They even had a Meredian beer on tap so not just the usual lagers that you would expect in a pub either. Food available aswell. They have even knocked the bar down in size to make more room. Shame the beer garden has gone though. Apparently the facade will remain but the rest will be knocked down and rebuilt, starting over Xmas. But at least it seems it will reopen as a pub (as well as lots of flats).